You'll be amazed at how much you'll get in one day with IAFP! We will host two ABFM Knowledge Self-Assessment (KSA) workshops, commitee and Member Interest Group meetings and an interactive plenary session on Health Equity. Our IAFP Awards will be presented (you're gonna love them!) and we'll finish the day with a reception and "Battle of the FMRs" game show. Learn more here. Online Registration deadline is Oct. 21. Book on HotelStorm with your exclusive Illinois Academy of Family Physicians discount (Code: MEMBERPERK) and get up to 40% off hotels worldwide. Online Registration Deadline is October 31! Join us in Madison, Wisconsin November 9-11 for the 7th annual Family Medicine Midwest Conference - "Advocacy for Health" Online registration is open, the schedule of presentations is posted, the plenary presentations are in place and the Welcome Workshops will provide a great place to start your FMM weekend. Learn more and register by October 31! Full conference and one-day registration options available to fit your schedule. -Our resolutions (AAFP Login required). IAFP submitted Resolution 411 - FDA and Low Nicotine Products and a late resolution asking AAFP to develop a Knowledge Self-Assessment (KSA) on Health Equity. Our FDA resolution was adopted by the Congress after we successfully argued against referral to the board. The ABFM Health Equity KSA resolution was referred to the board. -Michelle Byrne, MD (Northwestern McGaw Family Medicine Residency at Humboldt Park) joined the AAFP board of directors as the Resident board member. You can see her speech here - click on the link for "Second Session." -Although the Congress did not choose David Hagan, MD, of Gibson City, to join the AAFP board of directors, class of 2021, IAFP salutes Dr. Hagan for a wonderful campaign. In his concession speech, Dr. Hagan inspired others to run for AAFP board of directors. The American Board of Family Medicine (ABFM) announced a pilot program to begin in January 2019 that will assess the value and feasibility of a longitudinal assessment option to the 10-year secure examination. Jerry Kruse, MD, Chair of the ABFM Board of Directors, and IAFP member, announced this news at the 2018 AAFP Congress of Delegates. Physicians who are current with continuous certification and are due to take the examination in 2019 would be eligible to participate in the pilot. Dr. Kruse stated, "based on the popular Continuous Knowledge Self-Assessment (CKSA) platform, the longitudinal assessment pathway will deliver 25 questions online each quarter to those Diplomates who choose this new option. This approach is more aligned with the ongoing changes in medicine and draws upon adult learning principles, combined with modern technology, to promote learning, retention and transfer of information. 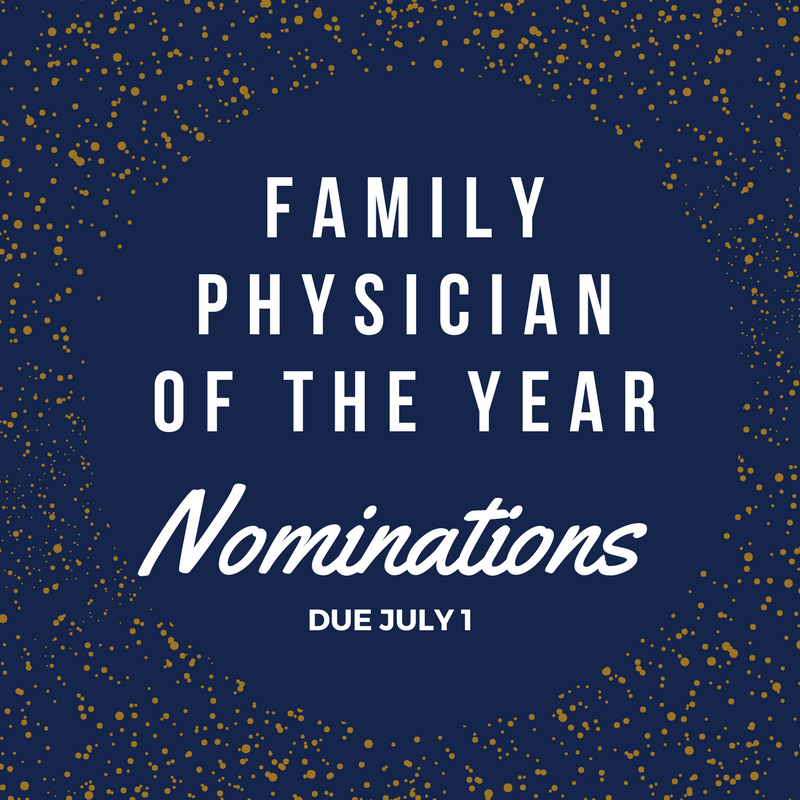 Over time, we will be able to assess the core clinical knowledge of board-certified family physicians and recognize the vast majority who work to keep up to date to take care of their patients." Learn more from AAFP. Join us for a FREE webinar on loan repayment and financial planning Wednesday, December 5 at 7pm with Todd Woodlee, Vice President of iGrad. You can register for this free webinar at www.iafp.com/partners-in-health. IAFP is one of only three chapters to receive the Pfizer Independent Grants for Learning and Change (IGLC) "Increasing Adult Pneumococcal Immunization Rates Through AAFP State Chapters." These 18-month quality improvement initiatives will develop effective tools and strategies to increase pneumococcal vaccination rates in adults, with a specific focus on adults 65 years and older and those populations in underserved areas. Look for findings to be presented at FMX in 2019, as well as chapter annual meetings in 2019 and 2020. Please email Gordana Krkic, CAE at [email protected] with your input as soon as possible. AAFP TIPS, Transformation in Practice Series, can help family physicians and their teams improve patient care and tackle operational challenges. The TIPS library launched with two topics: empanelment and quality improvement. Now three new topics are available: clinical data registries, continuity of care, and team documentation. Through 10/31, all topics are 25% off. Members may access team documentation at no charge, courtesy of the Physician Health First initiative. Learn more. Tony Hampton, MD was honored with the exemplary Partner for all Advocate-Aurora Medical Groups at an event Wednesday night. Dr. Hampton practices at the Advocate Medical Group - Beverly location. He is especially passionate about removing barriers to health and equipping patients with the education and resources they need to take charge of their own health. As medical director of the Advocate Operating System, he collaborates with clinicians and staff on programs to address social determinants of health among at-risk patient populations. Dr. Hampton serves on AMG's Governing Council, Health Outcomes Committee, and Advocate's Executive Diversity Council. Public Relations Task Force Chair Kristin Drynan, MD of Aurora was live on Illinois Public Radio's "Morning Shift" on October 12 discussion the importance of the flu vaccine and encouraging all listeners to get vaccinated, while also dispelling myths and taking questions on the air. Two Direct Primary Care Member Interest Group members were featured on NBC 5 Chicago on October 16th 10 p.m. news. The DPC practices of Clodagh Ryan, MD of LaGrange and Alvaro Encinas, MD of Chicago's northwest side were featured in this special report on the DPC model to provide high-quality primary care with direct access to your personal family physician. Learn more about the DPC MIG.